Ike Anigbogu #13 of the UCLA Bruins blocks a shot by Bitumba Baruti #0 of the Washington Huskies in the second half of the game at Pauley Pavilion on March 1, 2017 in Los Angeles, California. Bruins won 98-66. (Photo by Jayne Kamin-Oncea/Getty Images). Bitumba is the third UW Husky to transfer since the end of the season joining backup guards Carlos Johnson and Michael Carter III. In a widely anticipated move, Bitumba Baruti is going to transfer from Washington and plans to play basketball next season at another school. The 6-foot-6 sophomore guard, who scored 11 total points in 17 games as a reserve during the 2016-17 season, never found a role with the Huskies under new coach Mike Hopkins. Baruti was the only person on the 14-man roster who did not appear in a game last season, which proved to be clear sign that he was not included in the UW’s long-term plans. 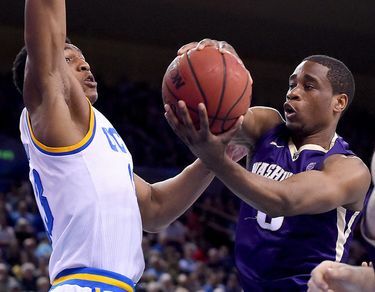 Since Washington finished 21-12 in the second round of the National Invitational Tournament, Baruti is the third Husky to transfer joining reserve guards Carlos Johnson and Michael Carter III. Junior forward Devenir Duruisseau who left the team in November. The departures leaves Washington with eight returning players, including forward Noah Dickerson who declared for the NBA draft but could return to UW because he has not hired an agent. The Huskies signed three incoming recruits (Jamel Bey, Elijah Hardy and Nate Roberts) during the early signing period last November and landed verbal commitments from four-star Bryan Penn-Johnson and Ed Chang. Wednesday marks the first day of the spring signing period in which recruits can sign scholarship papers with Division I teams. The period ends May 16. If the Huskies bring in a five-man recruiting class (there’s always a chance someone may reclassify for 2019), then they have enough spots on the roster to fit everyone. The NCAA allows teams to award 13 scholarships.